Although we have some of the best samples that exist for orchestration including Vienna Libaries and LA Strings, theres still nothing like the life that real orchestral performance brings to a track. For most the use of real orchestra is a pipe dream due to the huge cost. The string arrangement is created for the song and scored. We book the required amount of time for the song(s) with Mark at MPC productions who takes care of the rest. We pass a backing track of the song we work on plus the prepared score to the Orchestra's Dropbox / FTP site. 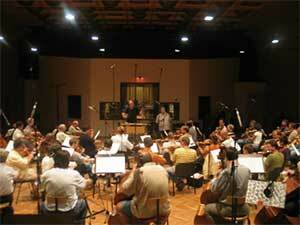 The Orchestra plays our arrangement and it gets recorded at the fabulous CNSO Studio in Prague. The costing is on a project by project basis. If there are only 1 or 2 songs to be worked on we also have the option of sharing 4 hours sessions with other MPC clients... effectively only paying for the time used by the orchestra!